you and i had a wonderfully grand adventure this past month. this adventure was SO grand that i am challenged how to even begin sharing stories in this space. coincidentally, it is time for my monthly letter to you, so this post can be devoted to you and i will share other details in the future. as you know, it all started around my birthday when we were gifted the opportunity to travel to south africa to visit kelsey, heather, and rowan. you were just as excited about this gift as i was, and we spoke non-stop about the trip in the weeks and days leading up to our departure date. what will it be like to spend two weeks with kelsey, heather and rowan? what will their house look like? will you like going to visit rowan’s school? will we see a lion? what does south africa feel like two decades after apartheid? will we want to come home? the plane rides were long, but we were too excited to really notice. when we arrive, it is late, and kelsey and heather pick us up and welcome us to south africa! we sneak into rowan’s room when we get to the house to say hello while he is dreaming. the next morning, kelsey and rowan wake us up. it is a bright, sunny, beautiful spring day. it is weird to be enjoying breakfast with them, and at the same time, totally comfortable. we sip smoothies and watch the blessbok walk around in their backyard. after breakfast, kelsey and i can’t find you or rowan. turns out you were both ready to go, in your seats in the car. you and rowan – within minutes – seamlessly fit into the morning routine as a pair. 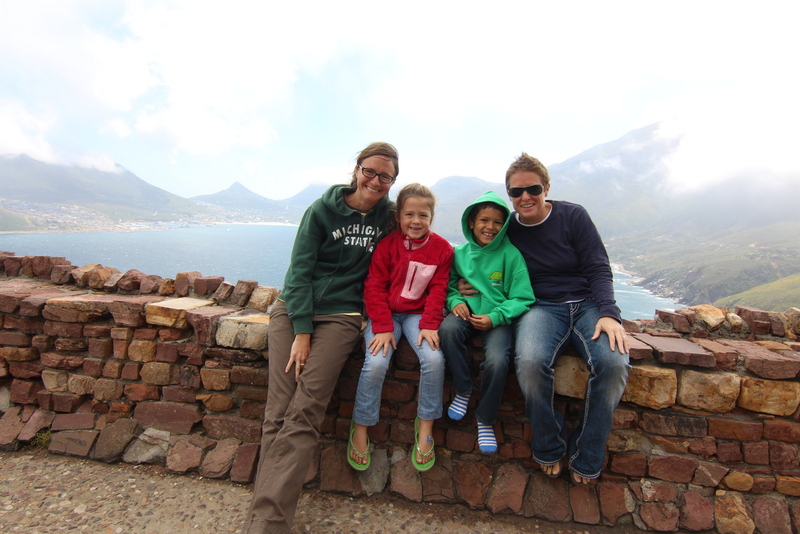 our first couple of days in south africa feel like a beautiful whirlwind. you practice your zulu. i take lots of pictures. we try to avoid the fact that we have jet lag. we visit the cradle of humankind, which is where some of the world’s hominid fossils have been found. 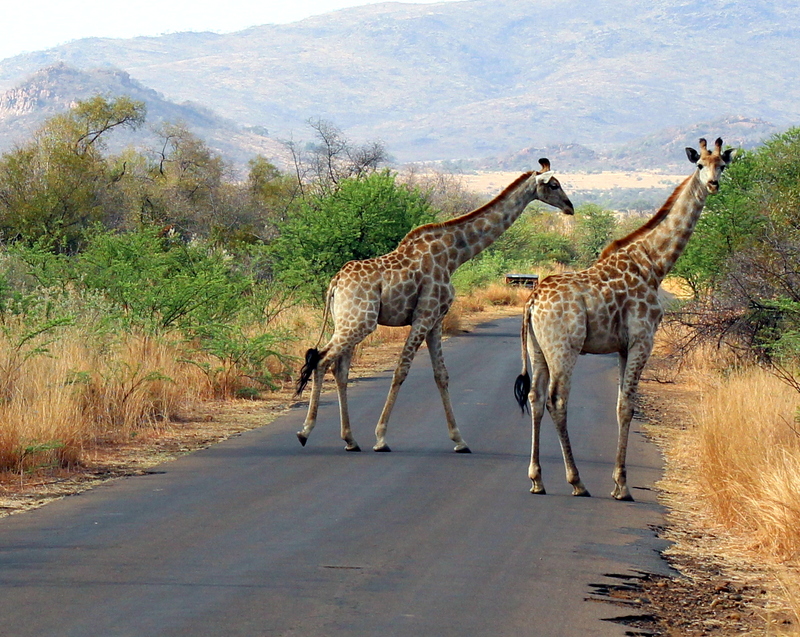 we go to pilanesberg national park, and see lots of beautiful animals. 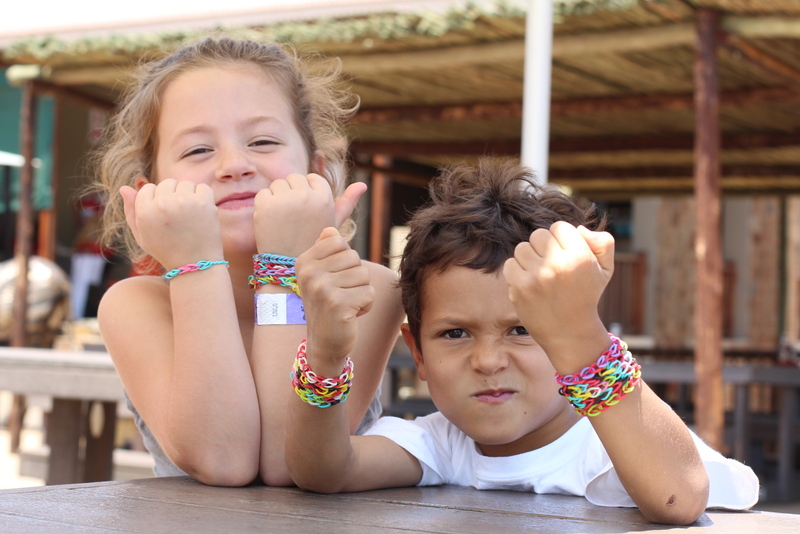 we stay in a safari tent, and the effects of jet lag are taking hold. you are wide awake at 10pm, with no sign of snoozing. i tell you to do math problems in your head. the next morning, we wake early to go back to find animals. 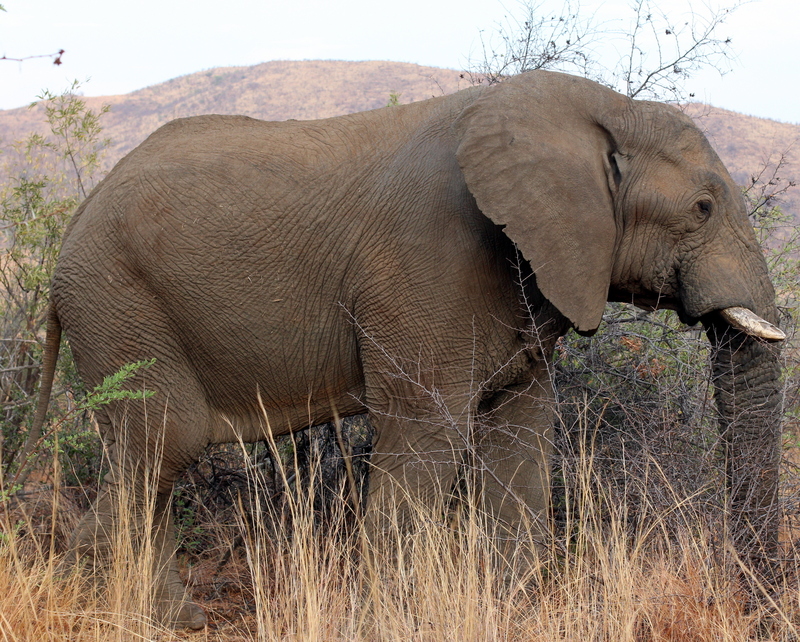 we end up spending a long while with a beautiful elephant. you and rowan are excited for a few minutes and then it becomes totally normal that an elephant is twenty feet away. i am amazed at how quickly the scenes in south africa become old hat for you. we have dinner at rowan’s favorite restaurant and i get a chance to meet some of kelsey and heather’s friends. you go to second grade with rowan. 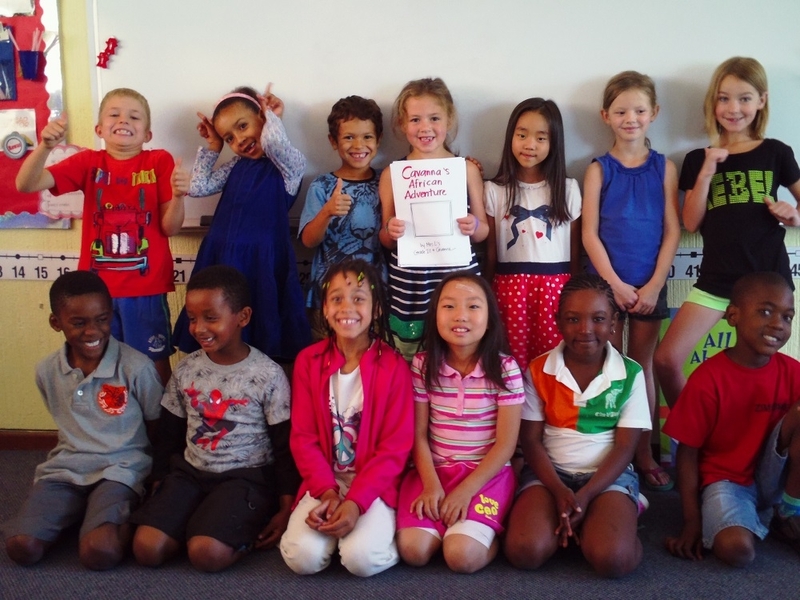 the students write a collaborative story about you and your adventure in south africa. when we pick you up at the end of the day, mrs. l (rowan’s teacher) congratulates you for attending a school in a foreign country and being a risk taker! i beam with delight, so proud of you and your bravery. 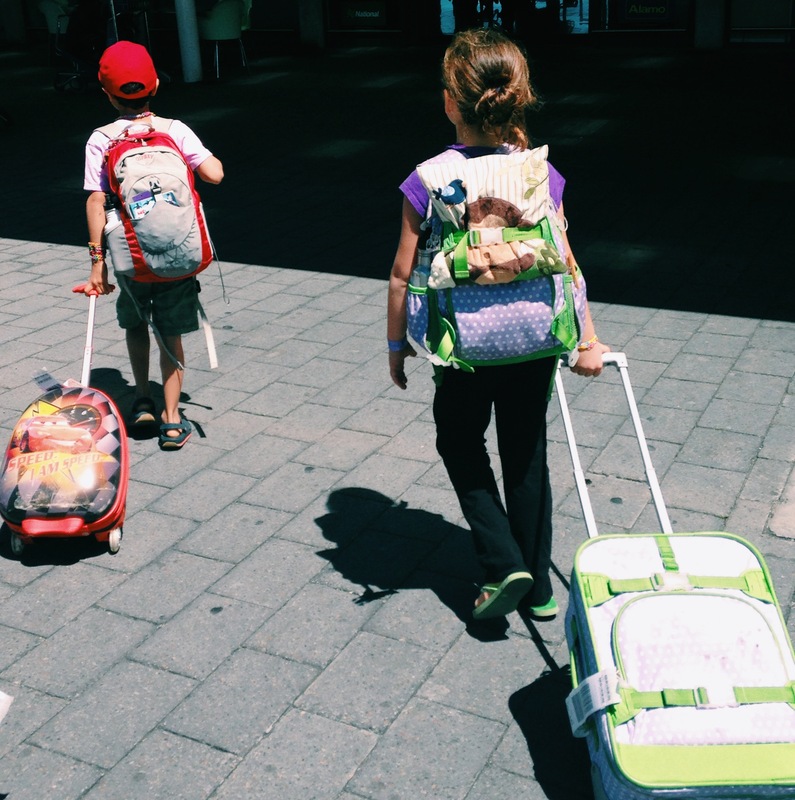 then rowan and heather’s school vacation starts! 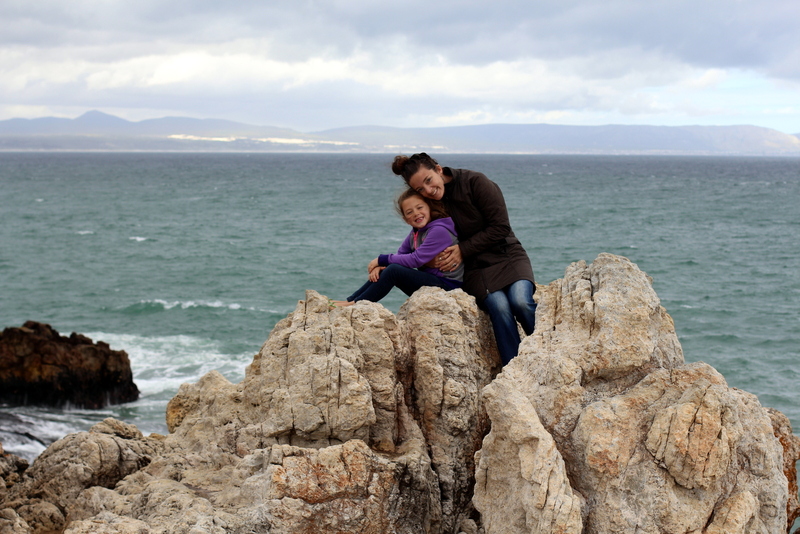 we fly into cape town and stay in a beautiful place called hermanus, which is known for it’s land based whale watching. we go out to dinner, watch whales, and enjoy each others company. you and rowan share a room and i cannot be more excited to hear the two of you giggling every night as you fall asleep. in the mornings, you bounce around the house and my heart is filled with joy seeing you in the company of another child in your day-to-day routines. 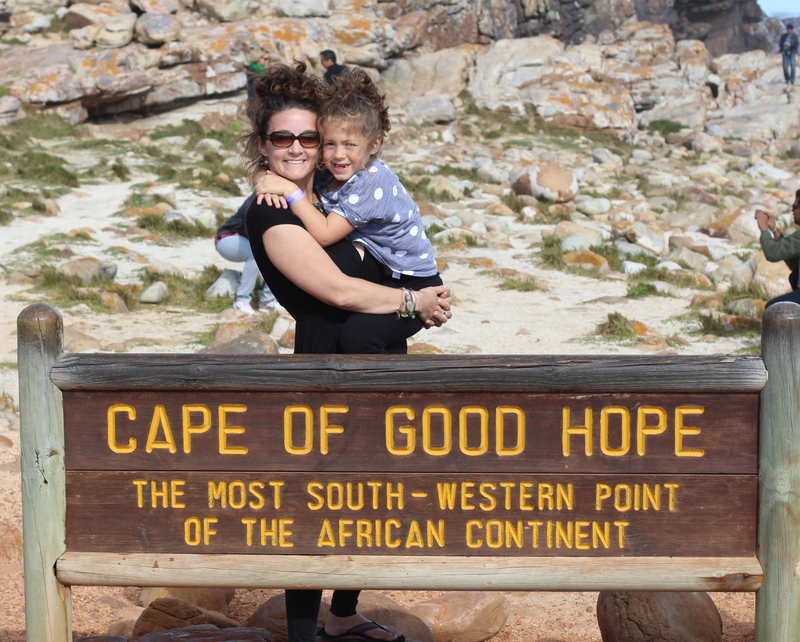 we visit cape point and cape of good hope. we see penguins. we watch more whales. 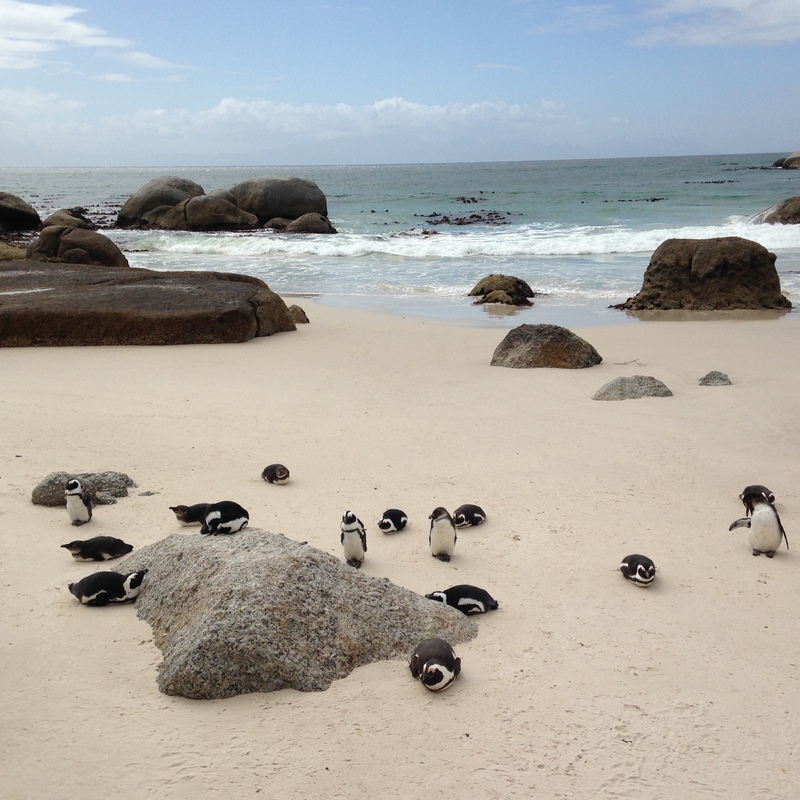 we hike table mountain and walk around the waterfront in cape town. you and rowan continue to get along beautifully, as your personalities seem to balance the other out. you are emotional, dramatic, and self-aware. rowan is compliant, even keeled, and consistently smiling. as the days pass, i am more and more grateful for this time we share with our friends. we return to johannesburg for one last day of our trip before our flight back to the states. you are excited about returning home, and i am sad, not ready to leave. 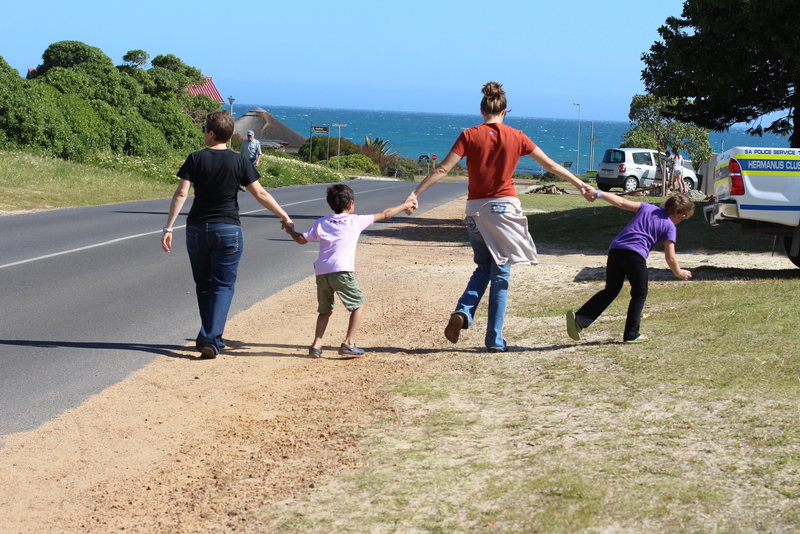 our last day turns out to be one of my favorite – and most emotional – aspects of our entire time in south africa. we spend most of the day in soweto, a large area of townships in johannesburg, with a new friend who was born, raised, and currently living in the area. there are miles and miles of shacks, piles of trash, and streams of sewage. much of what we see would be described by our society as disgusting. and yet, the energy and deep sense of community is evident, especially in the children’s faces. we see dozens and dozens of children, and you call out to them in zulu, waving and smiling. this behavior, although very typical for you, is actually a marked difference from the beginning of this particular day, when you were resistant to play on the playground with a group of young black boys. i had assumed you were reluctant to go to the playground because it was a large group of children that you didn’t know. you do end up on the playground, though. afterwards, i ask you about your reluctance and realize that it was mostly due to their skin color. to say i was shocked (sad, overwhelmed, frustrated, heartbroken) is a tremendous understatement. my mind was working at 190 miles per hour: how could i, a woman who lives, breathes, works for equality, produce a child that is afraid to play with a group of black kids? how could i talk to you almost every day about diversity and not get through to you? how could you – every day of this trip – happily converse with people from various backgrounds, and different skin colors – and now be resistant to it? am i a bad mother, to be living in new england, and not exposing you to these sorts of experiences more? i was so overcome with all of this, i began to cry. 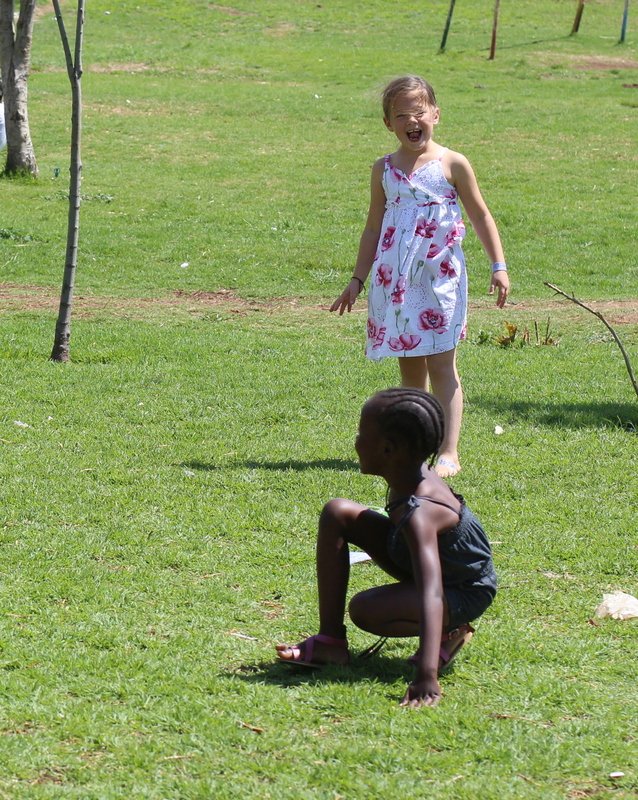 and then, within a few minutes, you and kelsey are playing tag with a group of black children in the field, and you are showing little girls how to do cartwheels with a huge smile on your face. as if the conversation about the playground never happened. i sit and watch, with sunglasses on, and tears brimming in my eyes. full of joy at this scene. and scarred by our previous conversation. 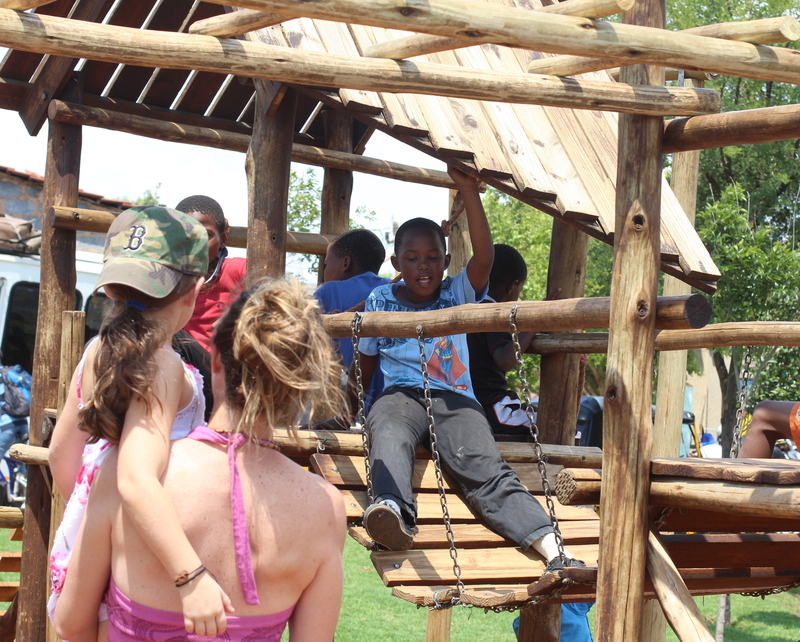 later that evening, after spending hours and hours in soweto with our new friend, after you interacting with beautiful, energetic children, i sit and talk with kelsey and heather about the playground experience. this, they reassure me, is good. it is good that you were alone, the only white kid, approaching a group of black children. it is good for you to feel what it is like to be in the minority. it is good that you are honest with me about your feelings, even though they upset me. it is good that we are in south africa, where you and i can have these sorts of experiences that are hard, but rich and full and exactly what i want to be teaching you, as your mother. it is VERY good that you overcome your fears and jump right back into playing with a group of black children you didn’t know, and are visibly happy. it is good, for me, to see that you and i need to go beyond talking and reading about equality. we need to feel it. 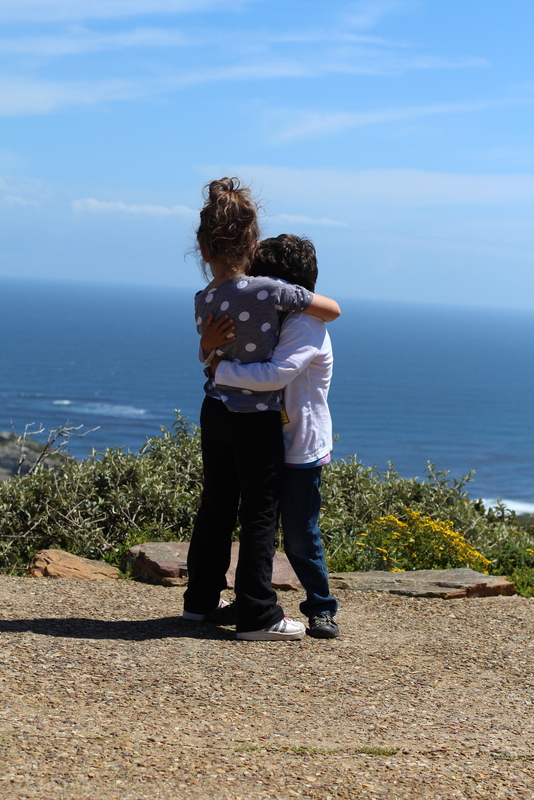 this trip, my little love, has brought so much abundance to our lives. not surprisingly, we have created new family dynamics with three amazing people across the world. i know that you and i will forever be grateful for this. unexpectedly, our day in soweto was a turning point for me, in my motherhood journey. i feel, in my heart and soul, the importance of sharing in these sort of life experiences with you. we can, together, create a better world for ourselves and others, filled with hope, strength in difference, inclusiveness, and respect. thank you for facing your fears with love. Very well written my friend. Sometimes I feel like I’m intruding when I read these letters to your girl but always I’m touched by them, the emotion that is shared, the real live feelings. The pictures, the few shared here are so awesome. When I was watching from here on IG, wow, the beauty and I’m sure in person even more so it was overwhelming. I’m grateful for you, the experience shared with your girl. The love of another family and their boy, I sure love the last image of the two hugging it out from behind. Dear Colleen, I am on the brink of crying when I look at the last photo of your daughter and Rowan, their love for each other. And your entire post to your daughter. Reading your words seem to be too good to be true. Reading your life experience makes me wonder about the beauty that really does exist in the world. I said it in my last reply to your post…Reading your words makes me a happier more peaceful human being. Thank you for sharing with me.